There are many activities on our farm. For a forage company to put their products in the market they have to do extensive research. This research has to be done in a laboratory and in the field through fieldtesting. Our principal needed an new researchcenter for their forage research. In 1992 the foundation was build for an intensive collaboration between the Vonk family and a milkpouder-manufacturer. After several meetings with the Vonk family a new agreement was put up to achieve this intentive collaboration. The company was renovated in 1993 with a new and modified stable interior, a tiled hallway, a storage warehouse for the forage and an custom build forage kitchen. An dedicated road for (un)loading was created alongside the stable. To weigh the forage and livestock new weighing-systems were installed. After all these modifications the research centre could start it’s activities. After a few initial hickups the activities were put in structure to distinguish the many types of animals and forages. There are as many as 500 calves in the researchcentre and they are grouped by 20-25 calves. Several forages are tested simultaneously. This means that many forage portions are weighed manually every day, depending on age, forage schedule and number of calves per group. Because of the diversity of products and portions automation isn’t an option. On a weekly bases calves are weighed and assessed individually. 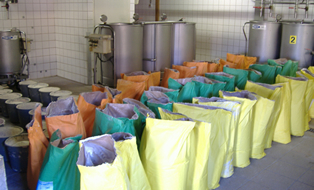 Digestive-samples are also taken for the laboratory. On the researchcentre the bloodsamples are analysed for hemoglobine (iron-value) by our own para-veterinarian. Besides the milk-nutrition the animals also get roughage and water. We also assess different types of delivery and compound of the roughage. The roughage being used is: chopped corn, luzerne, crushed barley, straw, steamed corn and powernutrition. All calves are being delivered through a tradingorganisation. De departure of the Rosé-startcalves also go through this organisation and the meatcalves ready for the slaughter go to regular slaughterhouses. Part of the livestock is for meatproduction, another part for breeding startcalves. Yearly over 80 animalgroups consisting of 20-25 calves are being held on the researchcentre. 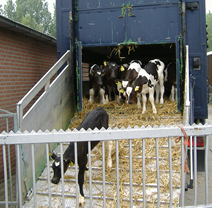 The calves are mainly bought in the Netherlands and Germany, but calves from other EU countries can be put to the testing. On the researchcentre there are also fieldtests with roughage for waterbuffalo’s. This was quit the challenge. These animals are completely different to handle in comparison to calves. They bond way stronger to their caretaker and don’t move aside when they don’t want to. These animals wait and watch what will happen. 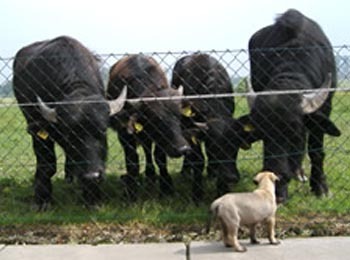 The need for fieldtesting on waterbuffalo’s originates in Italy where these buffalo’s are being held for the production of mozzarella. The milk of the waterbuffalo is used for the production of mozzarella cheese. To breed the waterbuffalocalves milkpwder is needed. This is part of the testing we did.